Score Big by Organizing Volunteers Simply! stands, team meals and more with online sign up sheets. 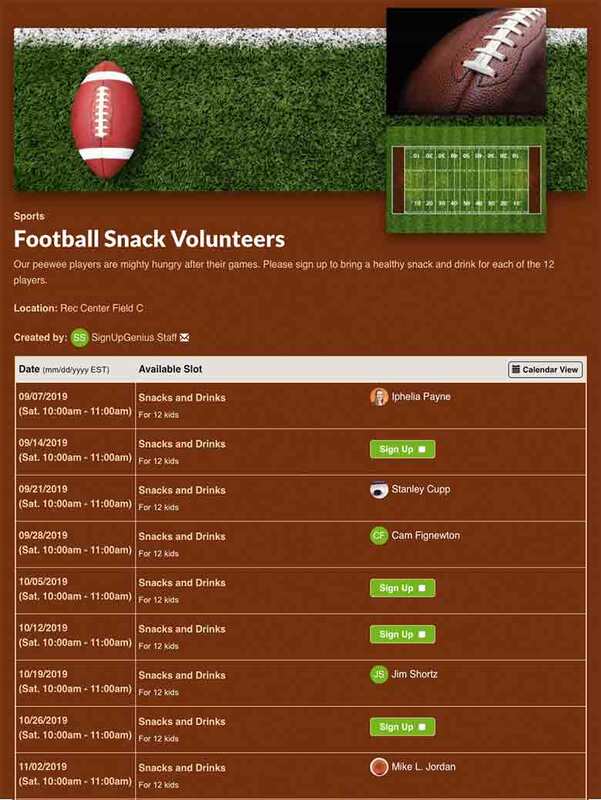 Coordinate team snack schedules and swap dates with an online sign up. 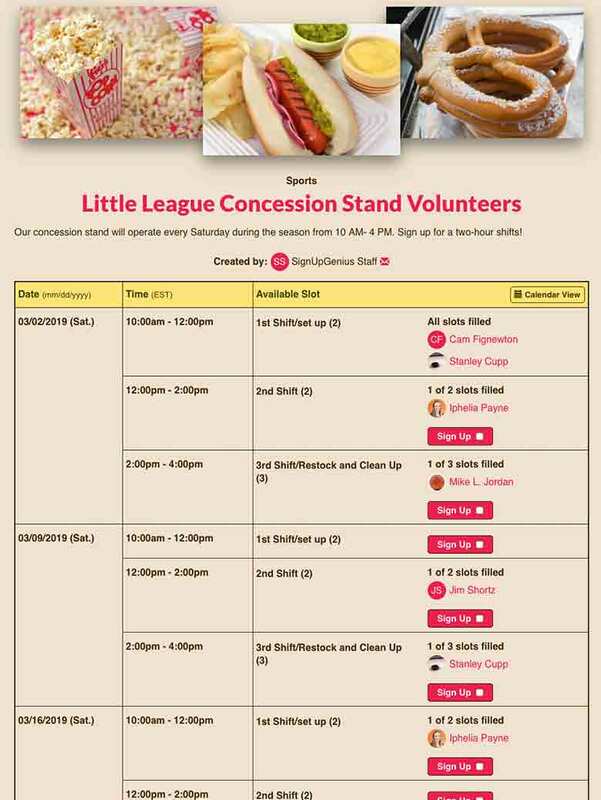 Schedule concession stand volunteers to raise money for your sports team. 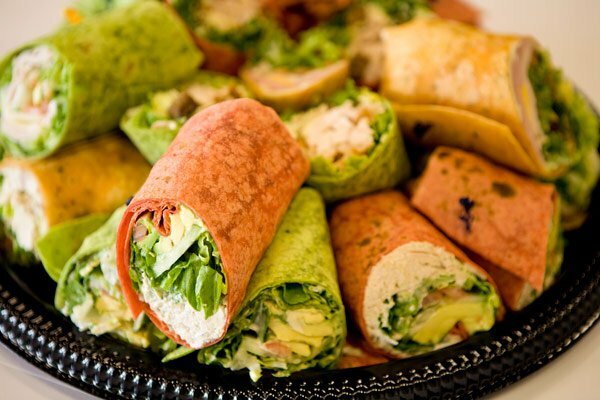 Plan an end-of-season sports banquet, team meal or party. 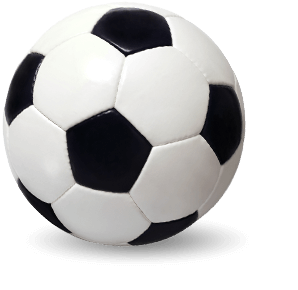 Schedule sports team volunteers for help with games, meets and tournaments. 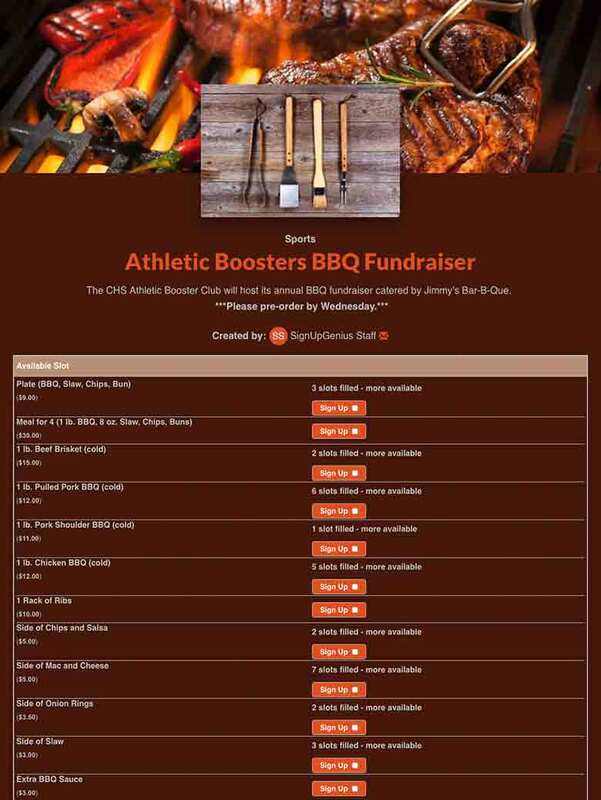 Collect money online for your sports team fundraiser with a sign up. 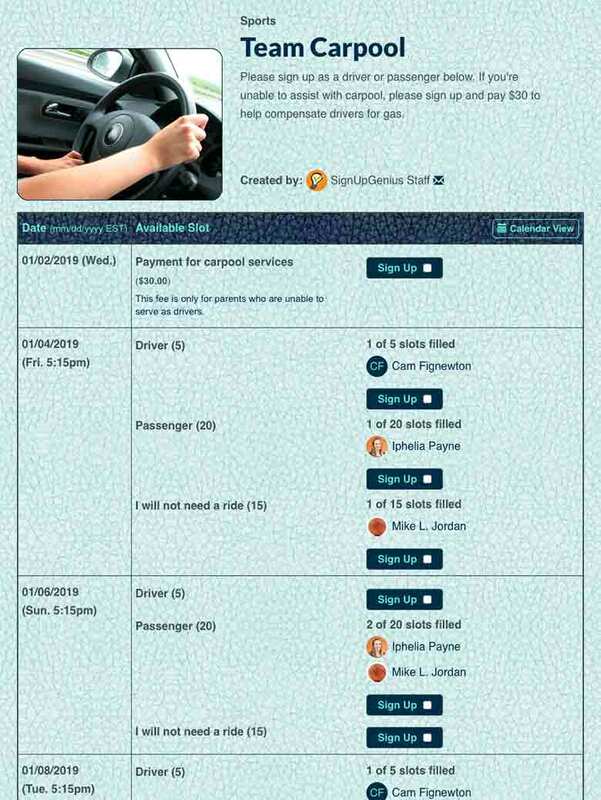 Coordinate sports team carpools and sync commitments to your digital calendar. 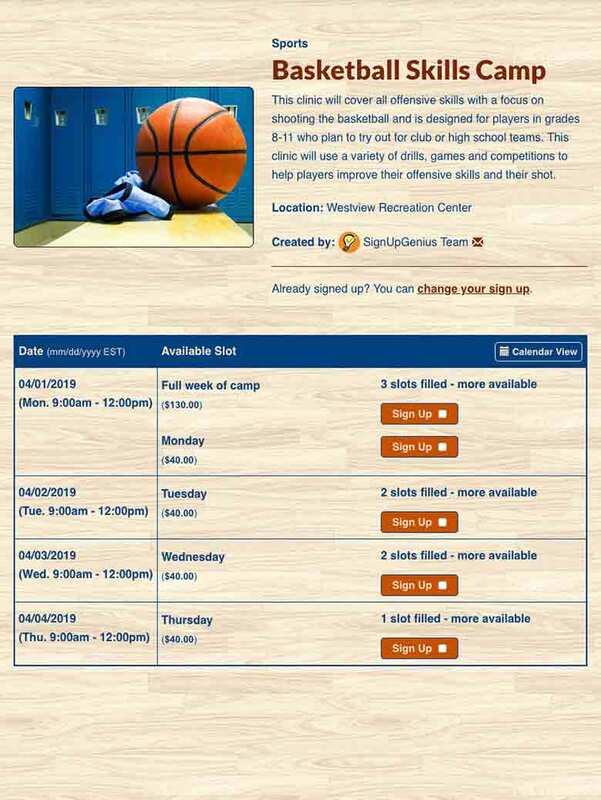 Organize sports camps and clinics, and register participants with online payments. 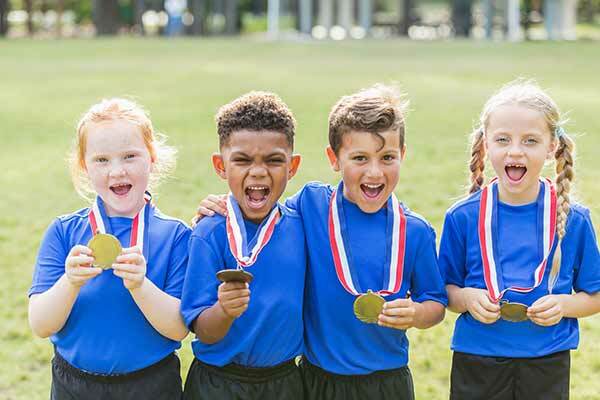 Raise more money for your team with these youth sports fundraisers. 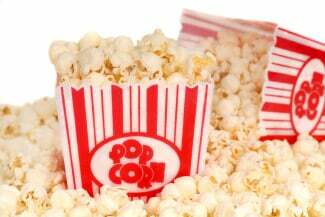 Keep operations running smoothly with these concession stand ideas. 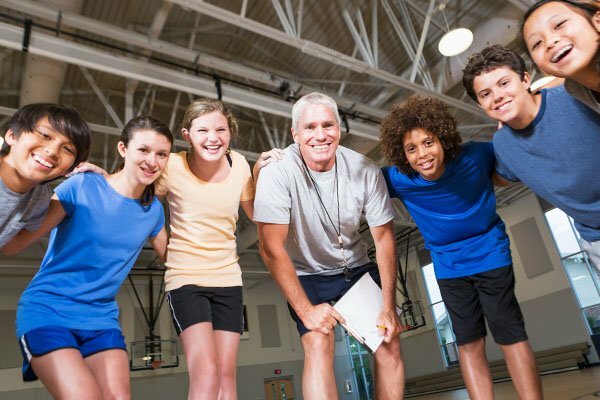 Create bonds that last on and off the field with these team building exercises for youth sports. Plan the perfect group meal with simple ideas from breakfast for dinner to potluck-style. 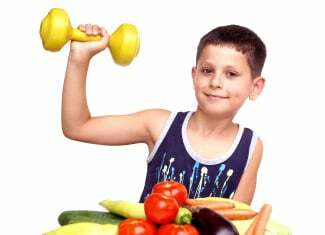 Fuel your kids for sports practices and games with these healthy snack ideas. Try these unique coach gift ideas that show your appreciation and don't break the bank. 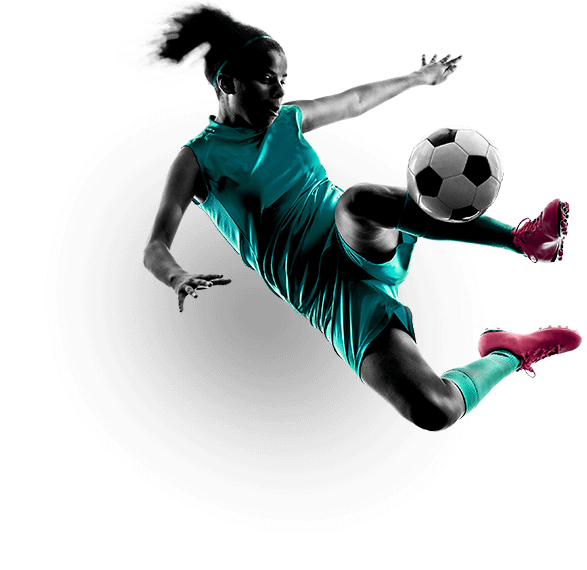 The organizers of the Dallas Cup, the oldest international youth soccer tournament in the United States, ditched confusing spreadsheets and streamlined volunteer operations by turning to SignUpGenius. Organizers can create a sign up for just their team or the entire sports league. Parents and volunteers can see all needs at once and sign up 24-7. Thank you for your easy-to-use, organized and foolproof service. As the concessions director at our ballpark, finding bodies to volunteer in our stand couldn't be simpler using SignUpGenius. I work 40+ hours at my day job and then set up and shut down the stand at the park. Time is precious. Thank you so very much for helping me get help AND, most importantly, support our neighborhood kids! 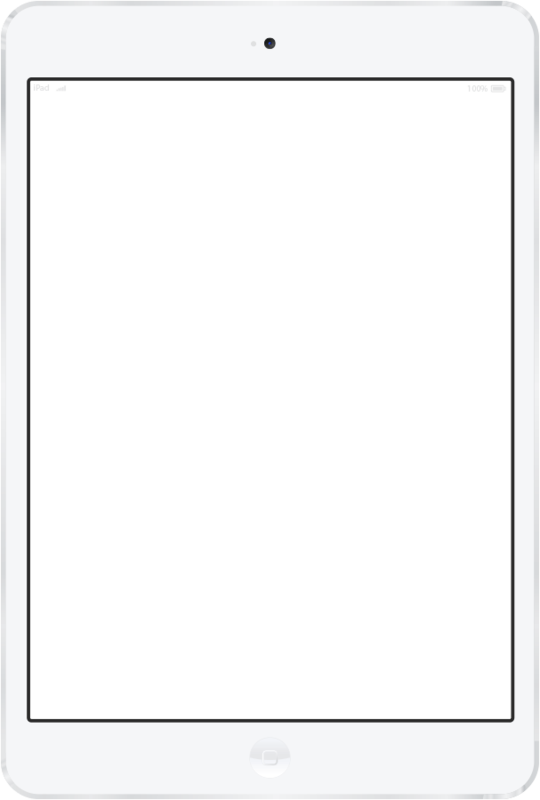 I just had to tell you how in love I am with SignUpGenius! I recently volunteered to be the parent coordinator for my daughter's tennis team. I just do not have the time to do everything via phone and email. Oh my gosh, you have made it so easy! Thank you, thank you! You have saved my sanity this football season for our carb fest dinner sign up (the eve before game day), concession stand sign up and tailgate sign up. I can add you to my "Favorites" list along with Post-it Notes and Sharpies! 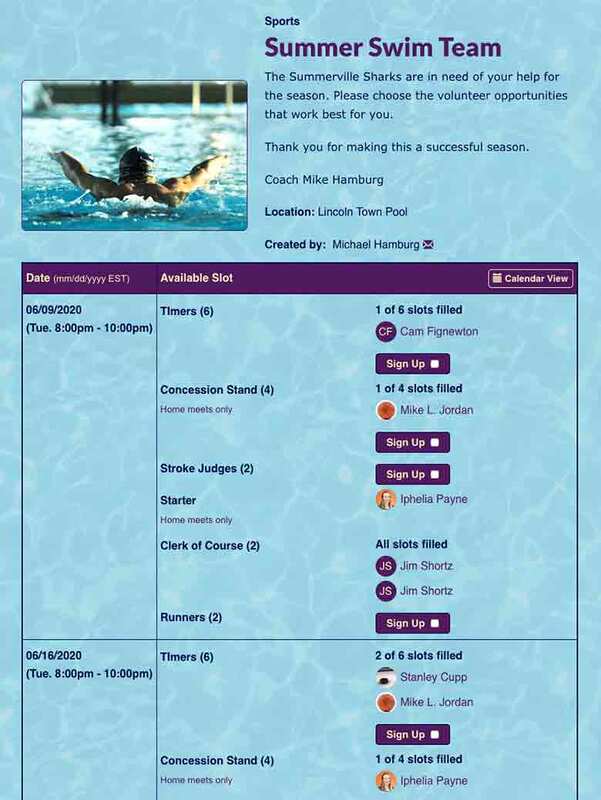 I've been using SignUpGenius for three years and have really valued the way it streamlines the process for recruiting and tracking parent volunteers of swimmers and soccer players. I wanted to thank you for the new option of sending emails to people signed up for specific slots. I needed to do just that today and it really saved time - again! ...Thanks again for continuing to improve your wonderful tool! This was our first year using SignUpGenius to coordinate volunteers for our girls Carmel High School swim team season. We absolutely loved it. It was so easy for volunteers to use and gave our coordinators the tools they needed to effectively manage the 240 volunteers for the multitude of activities throughout the five-month season.